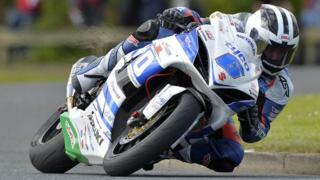 Highlights from Tuesday's opening practice session for the 2014 North West 200 international road races. Seasoned campaigner Michael Rutter, who has 13 career wins at the Northern Ireland event, claimed provisional pole in the Superbike class with local rider William Dunlop setting the fastest time in the Supersport. Austrian rider Horst Saiger posted the fastest Superstock time with Scotland's Keith Amor the quickest in the Supertwins.